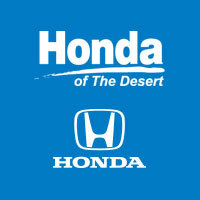 Honda of the Desert is proud to be your Honda Dealer for the Coachella Valley. If you are looking for a new Honda Accord, CR-V, HR-V, Pilot, or Civic, our team is here to help. You can search for the right model at a price you can afford using our website’s convenient shopping tools. Filter our inventory to find the vehicles the match your needs and then select “Verify Availability” to set up a time to test drive the car. Our website is also where you can order parts, apply for financing, and schedule your next service appointment. Our AdvantageCare prepaid maintenance program is a great way to save money on the services that your vehicle needs. At Honda of the Desert, we want to help you have the best car shopping, buying, and servicing experience possible. Please call us at (760) 888-5524 if you have any questions. If you find a vehicle that you are interested in, please come by to check it out! Our dealership is located in Cathedral City, and we serve drivers from all over the Coachella Valley, including Rancho Mirage, Indio, La Quinta, Palm Springs, Palm Desert, and more! *Closed end lease financing available through 5/02/19 on approved credit to highly qualified customers. Offer applicable to vehicles with a model number of FC2F6KEW only. See example stock number 820615 with corresponding VIN number of 19XFC2F6XKE202749 as reference for cars that qualify for this offer. All vehicles of this type available at this price. lease payment based on MSRP of $21145. Net price after discounts is $17359. No security deposit required. Excludes tax, title, license, options, and dealer fees. Amount due at signing includes first month’s payment, capitalized cost reduction, and acquisition fee. Your payment will vary based on final negotiated price. At lease end, lessee responsible for disposition fee and 15 cents/mile over 36,000 miles and excessive wear and use. 12k miles per year. See your dealer for details.